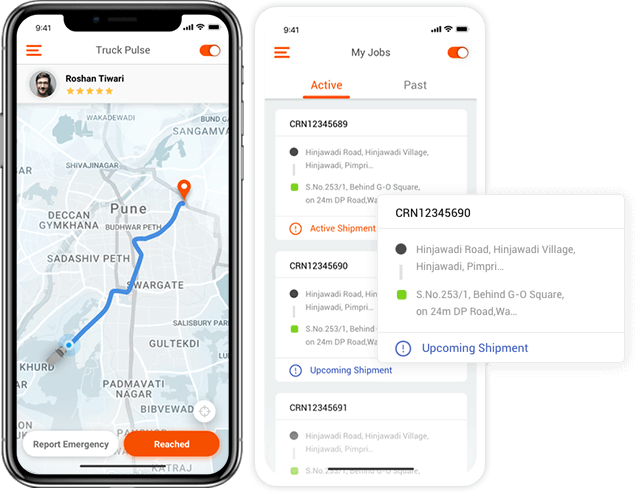 The app for truckers helps truck drivers get new shipment request, update load status and make the communication better. Simple driver registration process by the admin and providing them the sign in details for the app. Option for drivers to accept the shipment requests in real-time or complete their assigned requests. Document uploading option for drivers such as delivery confirmation, gate pass, and images for the toll. Drivers can switch between the availability status to offline when they don’t want to receive requests. Truckers will get full information on freight weight, pickup/drop location, load type, etc. Option to search for all the ongoing, upcoming, and past tasks in a single place. Drivers can view upcoming jobs, valuable data and earnings through a dedicated screen in the app. A feature to help truck drivers find the exact location to save time and fuel. We provide a feature-rich trucking app solution to improve the way truck drivers accept and complete the shipping requests.